Just 1-click for your often-visited web sites! No ads, no spam. 1-click to your favorite sites? 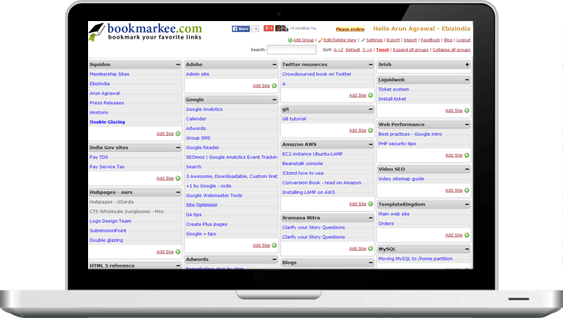 Bookmarkee is not a social bookmarking site. Only you can access your links page after logging in with your password unless you have marked your page as 'public'. Even then, others cannot add, edit or delete your bookmarks. You should bookmark sites that you intend to visit and not the ones that you want to recommend or promote to others. We do not track which sites you visit and how often. All links on Bookmarkee are direct links. This is a convenience service to allow you to visit your favorite site easily, be it your bank account management site or the server management console, without having to remember lengthy web addresses. Can others see which sites I am visiting? Your favourite sites appear on a password protected page and a result, only you (or someone you allow access to) can see which sites you have bookmarked. Your links are not available to the general public or the search engines unless you have marked your page as 'public'. This online bookmarking service is FREE. We do not charge you anything and do not show annoying ads or send spam to your registered email address. We only use your address to send a rare (and it's really rare) message about your account or your password when you forget it and make a request for it. What type of websites should I bookmark? You should bookmark sites that you need to visit often and do not want to remember the URL for, like forums, blogs, shopping sites, bank sites, reference sites and account login sites. Compare this to a social bookmarking engine like del.icio.us or Digg, where you put links to sites that you want to recommend to others. Can I access my bookmarks page when I am not carrying my laptop? Actually you can access your bookmarks from anywhere in the world. Just visit www.bookmarkee.com/yournickname (the one you registered), enter your password and you are ready to 1-click to your favorite online sites.